When is NOW a great time to get the body and the life you deserve? Boot Camp Longwood is an awesome way to lose weight, gain muscle, tone up and feel great! Get the body and the life you deserve today! 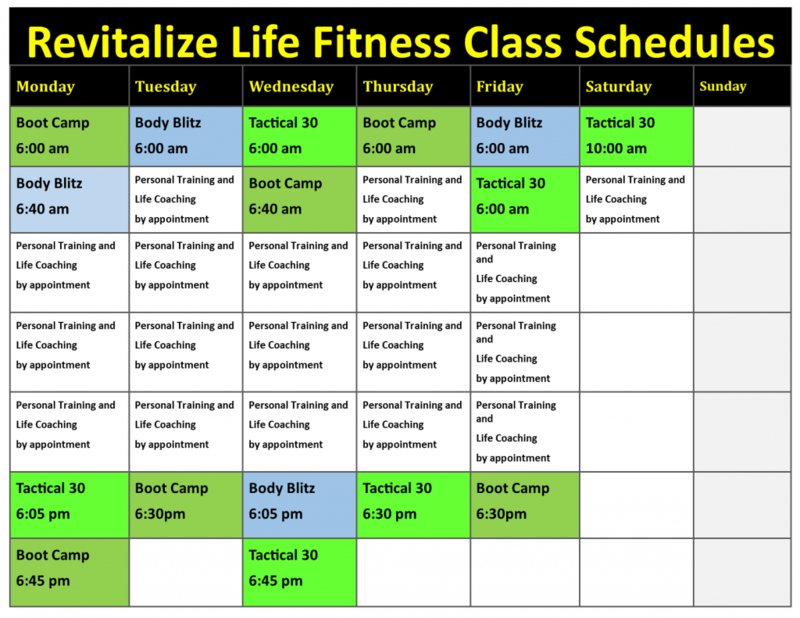 At Revitalize Life our Boot Camp & Body Blitz classes are designed to help you lose weight and tone up by combining a great cardio workout with light to moderate strength training! Classes take place in our air conditioned and extremely well equipped fitness studio in Longwood. Revitalize Life’s Boot Camp Longwood fitness class program is for all fitness levels and ages! Our classes are for anyone who wants to lose weight, toned up and feel great! See the calendar below to view class schedules! Builder a stronger, more tone and leaner body while creating a stronger structure! Develop your endurance for increased energy! Exercise releases positive endorphins that make you feel better! Improve your cadio endurnace as you improve your VO2 uptake! Balance, coordination and flexibility exercises are built in to our program ! Are you ready to transform your body and your life? Simply check in for your classes below or register to get started today! Click here to book and buy your classes!